Maitreya Buddha – whose name is derived from the Sanskrit maittri, which means “universal love” – will be the fifth and next Buddha to appear in the world during this “fortunate aeon of one thousand Buddhas”. We are currently in the period of Shakyamuni Buddha’s teachings and influence.It is predicted that as the world moves towards a time when Shakyamuni Buddha’s teachings will no longer exist, beings’ minds will degenerate and become increasingly obscured by emotional afflictions. Unskillful actions, which result in unhappiness, will be easier to create and outnumber skillful actions which are the causes of happiness. For thousands of years, negativity and misfortune will increase, and the human lifespan will decrease to the point where old age comes by the age of ten. Bodies will be ugly and deformed, and human life will be pervaded by torment, destruction, and destitution. 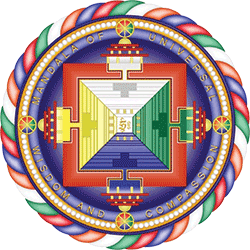 At this point, moved by overwhelming compassion, Maitreya will manifest in this world as a radiantly beautiful spiritual teacher. Beings of the time will understand the cause of Maitreya’s beautiful form is the practice of virtue, especially loving kindness. With this as inspiration, gradually, due to the merit of practicing virtue, human happiness will increase and after aeons pass, the human life span will eventually reach 80,000 years. 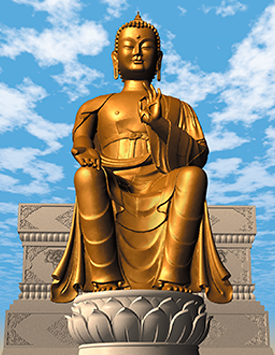 As the lifespan cycle turns and starts to decline again, according to prophecies by all the Buddhas and his own promise, Maitreya will manifest on the earth as the fifth Buddha.